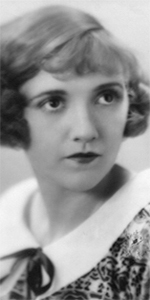 Constance Talmadge was another actress who became a star at the end of the short film era, and became a headliner at the beginnings of the feature film. Born into an unhappy family with an alcoholic father, Constance, her older sister Norma and younger sister Natalie, were raised by their mother Peg in hardscrabble conditions in Brooklyn. Peg snuck all three girls onto the Vitagraph studio lot in Flatbush, where, in 1914, Constance was given a role in a short film, Our Fairy Play (released in June, 1914), with comedian Billy Quirk, who had been making films since 1908 — which made him a verteran! She made a number of films with Quirk. In addition, she made films with Maurice Costello and his unit: The Moonstone of Fez (released in July, 1914), and The Mysterious Lodger (released in August, 1914), and with Paul Kelly: Buddy's First Call (released in May, 1914), The Maid from Sweden (released in June, 1914) - she did not play the title role), and Buddy's Downfall (released in July, 1914); Her last film released by Vitagraph was A Keyboard Strategy (released in August, 1915). Sister Norma had been offered a chance to make films in Hollywood, so Peg packed up all the girls and moved out west in 1915. The trip to make the films proved to be a disaster, as the studio folded just after the completion of Captivating Mary Carstairs, (released in July, 1915), in which a small role was given to Constance. Stranded in Hollywood, the Talmadges appealed to D. W. Griffith at Triangle Pictures; Griffith put Constance in two major roles in a film he was working on — Intolerance (released in September, 1916). While Peg and Norma returned to the east coast after their Triangle contracts expired, Constance remained out west. She seems to have been game for almost anything, with a vivatious spirit, sense of humor and an appreciation of the outdoors. Just the sort of leading actress picture makers wanted to use in their films. And work she did. In the late 1910s, she made five 50-minute-long films a year. She made two more films for Triangle before joining Norma and the gang back east: The Matrimaniac with Douglas Fairbanks for Fine Arts (released in December, 1916), and Betsy's Burglar also for Fine Arts (released in March, 1917). Then, she began starring in films for Select Pictures, which was run by Adolph Zukor and Lewis J. Selznick; pictures such as The Studio Girl (released in January, 1918). Select teamed her in several films with the original Harrison Ford (with Talmadge always receiving top billing), playing his wife in Mrs. Leffingwell's Boots (released in October, 1918), Romance and Arabella (released in February, 1919), and Happiness a la Mode (released in June, 1919). Also in 1919, Constance allowed Norma's husband, Joseph M. Schenck, to set her up with own production company, Constance Talmadge Film Corporation, releasing the films through First-National. She made six features in 1920, four in 1921, three in 1923, so it become apparent that it took longer and longer to find the right sceanrios to put her in. Her greatest success seems to have been Her Night of Romance, (released in October, 1924). 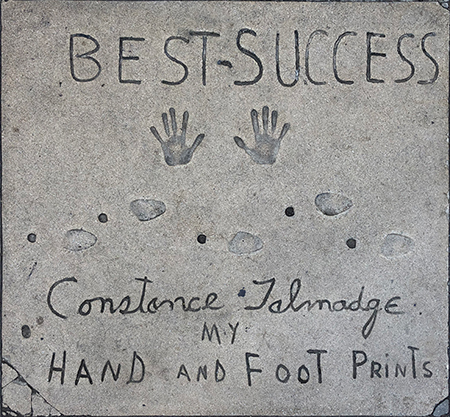 Constance Talmadge was the featured personality to appear at the groundbreaking ceremony for Grauman's Chinese Theatre on Tuesday, January 5, 1926, turning over the first shovel of dirt along with Charles Chaplin, Conrad Nagel, and Anna Mae Wong. She made her final silent film, Vénus (released in October, 1929), for an independent company in France in 1929. When sound came in, Constance Talmadge did not even bother; she quit the screen, married husband number three, divorced him in 1930; she then married husband number four, Walter Giblin, in 1936, and they remained together until his death in 1964. Constance oversaw her real estate empire until she died of pneumonia in 1973, at the age of 75. Grauman's Chinese Theatre, Hollywood, California. 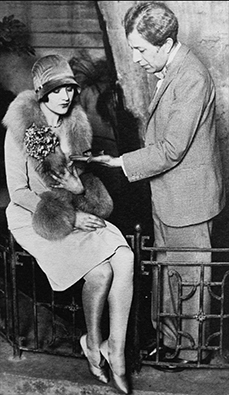 Constance Talmadge and Sid Grauman. Date unknown, but probably taken in connection with her Forecourt ceremony in 1927. Mr. Grauman appears to be showing Ms. Talmadge a goldfish from the east fountain — after the installation of a low iron gate. The fountains originally did not have anything around them.